The Dior Homme aesthetic has, at least since Kris Van Assche took over from Hedi Slimane, been synonymous with fluid tailoring and a monochrome colour palette. Grey and beige suiting has dominated the French powerhouse's catwalk since 2008, and Van Assche worked his studio hard to really show the craftsmanship and traditional skills behind the brand. For Autumn Winter 2012, Van Assche took the decision to push things forward; instead of pursuing one abstract notion, the Belgian designer built on one hands-on design concept and hammered home the idea with wave after wave of focused looks. "It actually all started with my longing to do sportswear, because I've been concentrating on tailoring until now and I never really found the right approach until now with these military uniforms and coats"
The loose theme, at least as seen from the benches, was a sharp and tailored army uniform-inspired look... not so much because of military details, but due to the straight and formal lines, strict atmosphere, harsh cuts and precise colourways. 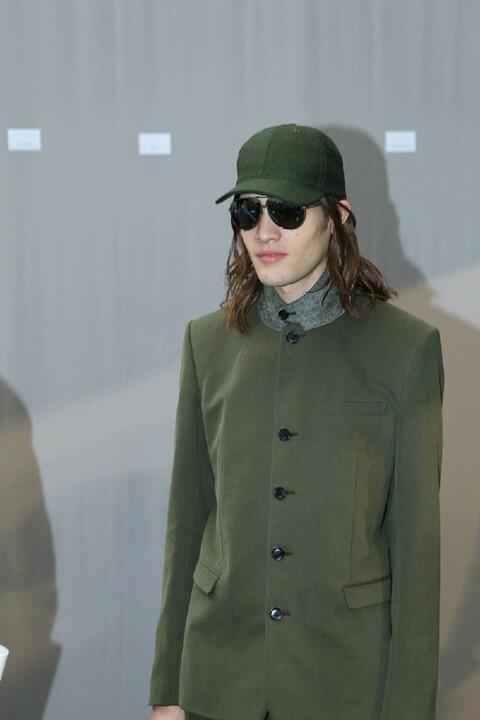 Sure, the baseball caps slanting forward and silver aviator sunglasses helped, but it was more about the attitude of the models as they literally marched down the catwalk. Olive green dominated the first section. Coats zipped up along the back, four-button suits, leather bombers and parka coats, oversized plastic capes and M65-style jackets with drawstring waists reinforced the look. "It made sense to use what I've learnt from tailoring in the sportswear. It is true that I like a certain rhythm and order and… it's a peaceful army"
Off-white and black sections were then introduced as continuation of the quasi army theme. In line with Van Assche's earlier idea to show off the Dior studio's skills by putting suit jacket seams on the outside, we also saw several coats with either white wool details or satin lining on the outside, making them look reversed. Towards the end, several pieces with embroidered white and grey birds appeared. Looking like a camouflage pattern of peace doves, they were the perfect grande finale to the show. Dazed Digital: There's an obvious nod towards army with the colours and attitude, right? Kris Van Assche: It actually all started with my longing to do sportswear, because I've been concentrating on tailoring until now and I never really found the right approach until now with these military uniforms and coats. It made sense to use what I've learnt from tailoring in the sportswear. It is true that I like a certain rhythm and order and… but yeah, it's a peaceful army! Kris Van Assche: That's exactly what I applied on the sportswear so that's how it all made sense. I've done it a lot on the tailoring, and I still do, and now we applied the same craftsmanship on the coats. DD: You say sportswear but it's still a fairly formal type of sportswear, right? Kris Van Assche: That's how Dior should do sportswear! DD: Is there a piece that sums up the collection?